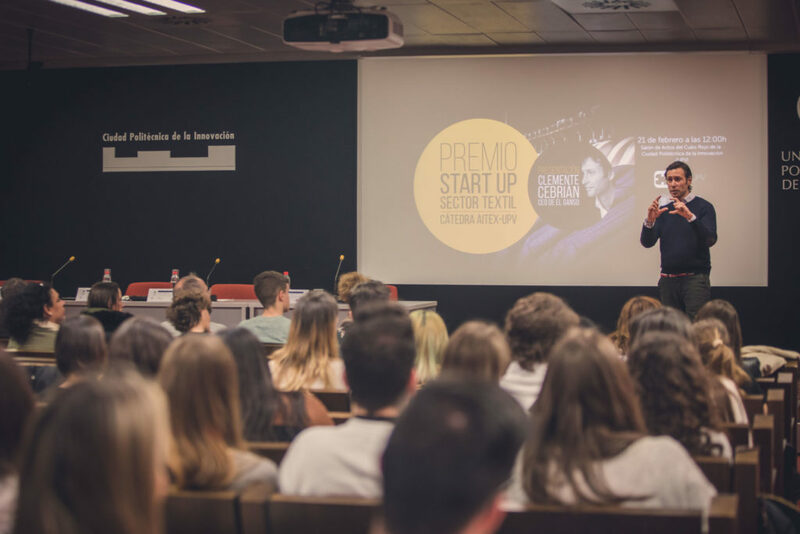 On February 21, the first Start up Award for textiles, organised by the AITEX-UPV Chair, was held. The event kicks off a series of workshops organised to support the initiative. On this occasion, we had the company of Clemente Cebrián, CEO of EL GANSO. Clemente delighted the audience by talking openly about his own experience as a fashion entrepreneur. The vice-chancellor of employment and entrepreneurship of the UPV, José Millet, highlighted the importance of entrepreneurial activities, which help to strengthen students’ knowledge by giving them greater perspective in their approach to work, when undertaking a new challenge or project for themselves or for others. Quico Sempere, head of the Institutional Department at AITEX, spoke of the potential of the textile sector, currently experiencing a digital transformation, where you compete in a more global and competitive world. 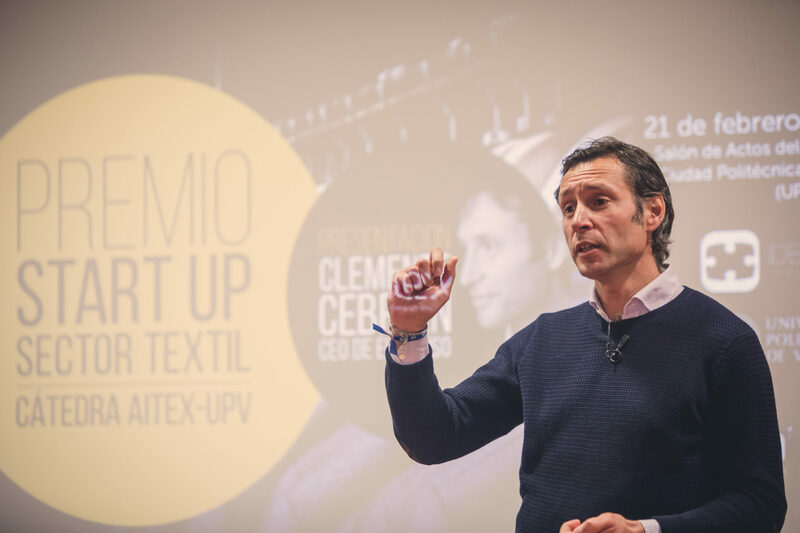 The Director of the AITEX-UPV Chair, Pablo Díaz, presented the rules of the Start-up Award that aims to recognise and reward the best entrepreneurial initiatives for start-ups in the textile sector to strengthen entrepreneurial spirit. €3,000 will be awarded to the winning idea, in addition to free enrolment on the Textile Technology course taught online by AITEX. The story of EL GANSO began with the brothers Clemente and Álvaro Cebrián who spent their summers in London learning English, and saw clothes that excited them. That type of clothing was not to be found in Spain so they set out to begin fashion careers. Like any beginner, they made mistakes: for example, their first checked shirts lost their squares in the wash, and trousers faded. They attended an international fair with their autumn-winter collection, when the fair was spring-summer! They had to find opportunities in these moments of crisis, so they looked for customers from northern Europe to show what they had designed for spring. With healthy doses of humility and sincerity, Clemente told us the story of success and failure that EL GANSO has been through. Above all, what they came away with was that in the world of the entrepreneur you have to make many mistakes to learn from all the errors. After the Start-up Award, two more workshops have been organised to support the initiative. The next will be a workshop on business models held on March 7 at the UPV Campus of Alcoy and March 14 at the UPV Campus of Vera. During this workshop, the approaches based on Lean Canvas and business viability plans will be presented using exhibitions and practical cases. The next workshop on success stories will be held on March 28 at the UPV Campus of Alcoy, and on April 4 at the UPV Campus of Vera. This session will be presented by SEPIIA, by the entrepreneur Federico Sainz, founder of this highly innovative company, who will talk about his experience as a textile entrepreneur. The AITEX-UPV Chair was born from the collaboration between the two institutions to carry out activities of common interest. Its purpose is the promotion and development of activities that contribute to positioning the textile sector, both at the university level and at the level of society in general. The Chair aims to raise the profile of the textile sector as an attractive employment proposition with a bright future, within the specific objectives of the University.